There have been different theories put forward on the origin of the Salars. The prevalent view held at the moment is that the ancestors of the Salars came from the region of Samarkand in Central Asia during the Yuan Dynasty (1271-1368). Xunhua County, which the largest group of the Salars live, is a mountainous area situated along the banks of the Yellow River in southeastern Qinghai Province. Although it has a mild climate and fertile land crisscrossed by canals, it is handicapped by insufficient rainfall. The Salars are mainly farmers, going in for such crops as wheat, Tibetan barley, buckwheat and potatoes. As sideline occupations, they engage in stock breeding, lumbering, salt-producing and wool-weaving. 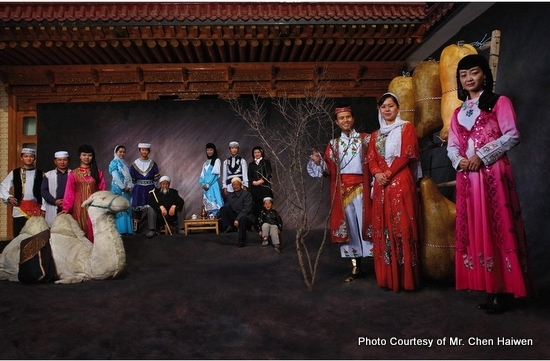 During the Yuan Dynasty, a Salar headman bearing the surname of Han was made hereditary chief of this ethnic minority. With the rise of the Ming Dynasty (1368-1644), he submitted to the new rulers and continued to hold his position. He had under him a basic bureaucracy which looked after such things as military affairs, punishments, revenue and provisions. Following the development of the economy and the expansion of the population, the region inhabited by the Salars was divided into two administrative areas, i.e. the "inner eight gongs" of Xunhua and the "outer five gongs" of Hualong, during the early period of the Qing Dynasty (1644-1911). A "gong" included a number of villages, equivalent to the later administrative unit of "xiang" (township). As the Salars were devout Muslims, the villages were built around mosques. The language of the Salars, which belongs to the Tujue (Turkic) branch of the Altaic language family, is almost identical with the languages of the Uygurs and Ozbeks, with whom they share the same religion. It contains quite a number of words taken from the Chinese and Tibetan languages as a result of long years of mutual contacts. 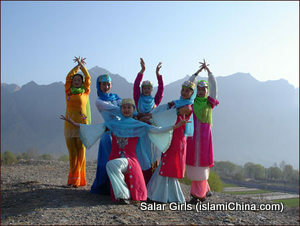 Nowadays, most young and middle-aged Salars know how to speak Chinese, which is also accepted as the written language of the Salar ethnic group. The Salar people have a rich and colorful tradition of folklore. Many of the legends, stories and fairy tales sing the praises of the courage and wisdom of the Salar people. The typical folk tune genre is the "Hua'er (flower)," a kind of folksong sung sonorously and unrestrainedly in the Chinese language. However, in most cases it is presented with a sweet, trilling tone due to the influence of Tibetan folk songs. The singers are all able to fill in impromptu words according to whatever happens to strike a chord in their hearts. Amateur theatrical troupes, and song and dance groups are flourishing among the Salar people. Deeply influenced by Islam, the customs and habits as practiced among the Salars are roughly the same as those of the Huis that live nearby. Women like to wear hijab on their heads and black sleeveless jackets over clothes in striking red colors. They are good at embroidery and often stitch flowers in five different colors onto their pillowcases, shoes and socks. Men wear flat-topped brimless hats of either black or white colors, and wear sheepskin coats without linings and woolen clothing in winter.